You still can’t believe it. No matter how many times you pick up that piece of paper and read it, the only phrase that really mattered jumps out at you: merchant account application denied. You’ll give them credit for all of that. But it might as well have included — in large red letters — “DENIED” stamped across the upper right-hand corner, as in movies of old. Now, what are you supposed to do? As your ecommerce website nears completion and your product inventory grows, the last item on the to-do list just fell apart with the merchant account application denied letter. Didn’t you do a good enough job on the application? And what’s the thing about your chosen business being high risk, and therefore not appropriate for your bank? What does that mean, and what can you do about it? OK, take a deep breath. Inhale — exhale — and listen up. All is not lost. …Toward a high risk merchant account instead of a traditional one. Need to know the difference, and what signs to look for? Let’s take a look. No doubt you already know that a merchant account is the type of bank account needed for an ecommerce business to accept and process debit card, credit card, and other forms of payment transactions. To understand the high risk label, walk a mile in your banker’s shoes because the tag represents a service provider’s point of view. Keep in mind that merchant accounts operate as a type of personal loan. If you’d have trouble qualifying for that personal loan or a mortgage, expect to see merchant account application denied this time too. Credit card brands, banks, and some payment processors rely on professional risk management principles to remain profitable, avoiding the risk of potential losses whenever possible. Why waste time and energy hoping your new venture can beat the odds and avoid merchant account application denied? These signs point merchants toward high risk merchant accounts instead, to meet their payments needs. It may be as simple as opening a startup business. Unless you have an outstanding track record of commercial operations — and stellar personal credit — banks may be wary. According to experts, at least seventy-five percent (75%) of startups fail. Also, ecommerce in general carries extra risk associated with the inbuilt CNP (card not present) payment environment, which carries increased fraud risk. Poor personal credit history, prior bankruptcy. A merchant’s personal and business credit histories, criminal record, and other reputational dynamics factor in to determine if you represent a good risk. Do you pay personal and business debts on time, and operate in a legal and responsible manner? Do your credit report and a personal background search prove it? If not, expect to read merchant account application denied when you receive the letter. Choice of industry sector. Certain verticals — with complex or dynamic business models not well understood by traditional banks — attract the “high risk” label and are therefore verboten by some banks, processors, and credit card brands. Some are prohibited entirely (such as adult-oriented and casino, gambling, or gaming sites) due to financial and reputational risk. Highly-regulated industries may also be frowned upon (cosmetics, wellness, and tobacco products). Subscription-based businesses. While the subscription economy is alive and well, ecommerce businesses built on the subscription model fall into the high risk category. Examples include online dating sites, financial newsletters, book clubs and magazines, movie and music subscriptions, software, and many more. Also known as “recurring billing models,” these businesses typically experience higher than average chargeback and online fraud rates and so attract the label. High-cost products. Products like airline tickets, travel packages and timeshares are considered high risk, as are travel agencies in general. Purchases of these products tend to occur well in advance of use, leading to high rates of cancellations, returns, and refunds. Small travel agencies fail and close up shop, leaving banks and processors on the hook for refunds when reservation cancellations occur. American business woman Michelle Phan said, “I believe that rejection is a blessing because it’s the universe’s way of telling you that there’s something better out there.” So, if you expect to hear merchant account application denied, reach for something better to start with and avoid the rejection. 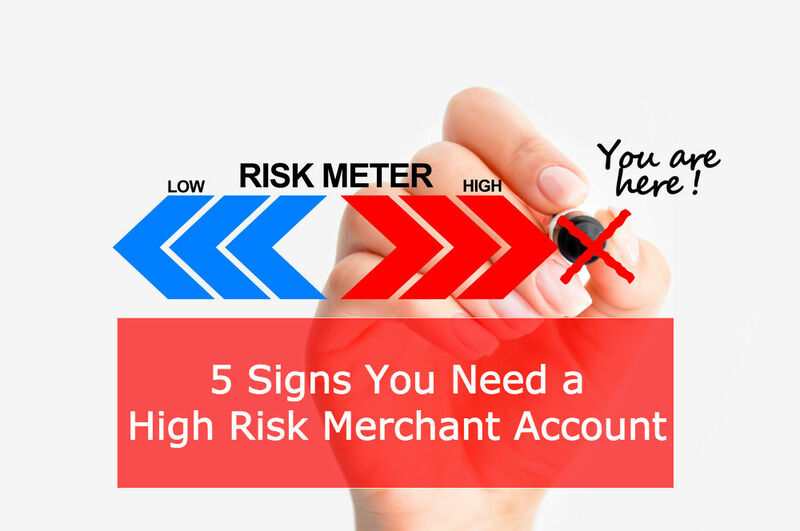 Reach for the high risk merchant account your business needs. MerchACT specializes in working with high risk businesses, and will help you achieve the merchant account(s) you need. We’re a leader in risk management technology, and have worked with businesses like yours for more than 15 years. We specialize in providing merchant accounts and the tailored, end-to-end managed risk payment processing solutions that help high risk businesses prosper. Our customizable services help you to take advantage of your market. And our managed risk accounts allow you to use your business resources more efficiently, reduce losses, and maximize profits. At MerchACT, we’re upfront about costs and services throughout the process — in keeping with our values of transparency and accountability. We provide the solutions you need at a low cost with no application fees, no volume caps, and faster transaction speeds. MerchACT considers you to be a business partner, not just another customer. We want you to succeed, because our success relies on yours.